Submitted by witness on Monday, October 22, 2012. OBSERVED: I'm a Native American from Montana. I live on the Flathead Indian Reservation. About two years ago I was hunting up on your mission mountains. The spot I was hunting is called North Crow. I was driving up through there looking for deer. I was coming to this corner and out of the corner of my left eye I seen him standing close to the road but still in a little bit of trees. I knew what it was. About a mile up the road ends, I knew I had to come back down. I was so scared to go back down but I knew I had to. I was driving pretty fast back down and did not look anywhere, just eyes on the road. I did not want to see him again. Have not been up there since this story I'm about to tell you is why I'm getting a hold of you guys. My little brother and my little sister and her boyfriend went hunting above Dixon. They ran into some elk and my little brother shot one. They were siting there gutting it out when a big rock was thrown on to the road. They said the rock was big, at least a 100 pound rock. They said the rock did not roll down, it was thrown. There is a lot of people around here that have seen and heard stuff too. You can call me and I can tell you more. OTHER WITNESSES: The frist one it was just me, the other my little brother, my little sister and her boyfriend. OTHER STORIES: I've heard a lot of unknown stuff up there before. I have heard tree knocking before just thought nothing of it. TIME AND CONDITIONS: Both were in afternoon. The witness is a Native American living on the Flathead Reservation. He filed his report from two years ago and also a more recent story his brother and sister told him. I encouraged him to have his family file a report regarding the rock throwing incident. 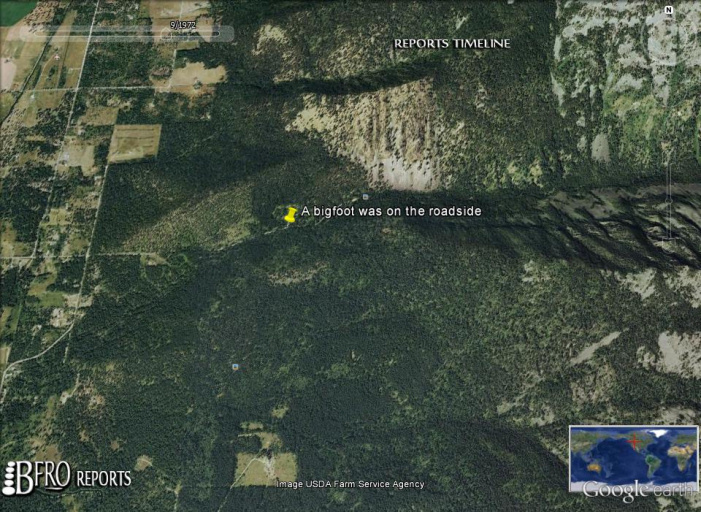 In the fall of 2010, he drove in the Mission Mountains on a snowy day on Crow Road hunting. The road is a dead end and was icy that day. There was about two feet of snow on the ground and more wet snow was falling. The time of day was after 1 PM but before 3 PM. As he drove up and rounded a curve on his way up at about 40 mph, he saw a tall, dark brown biped standing at the tree line on the left side of the road. The tree line runs right up to the road, so it was just about 2 -3 feet from his truck. He felt it was so close that if he had reached out his arm he could have touched it. He always drives with his window open a crack no matter what the temperature. It was standing in between the trees and blended in very well, but was still visible. Its hair appeared wet from the snow, and it stood about 7 feet high. It had its right hand holding a branch as it stood there. He describes it as being “very BIG,” in regards to its body build. His tribe believes that you must never look the sasquatch in the eyes, and he tried not to look at it. He was so scared he felt his body flush and turn cold. The road was a dead end, and he was very apprehensive as he knew he would have to drive by it again on the way back down. Once he got to the end of the road, he gathered his wits, rolled up his window and drove down as quickly as he could. He was grateful it was no longer in the same place as he felt he couldn’t have handled seeing it again. Every time he has driven to this location he has seen deer. This time he didn’t see anything but the sasquatch.